Shocking footage has emerged of a group of cyclists being knocked down in Yeovil, U.K., by a pensioner which has been banned from the roads. 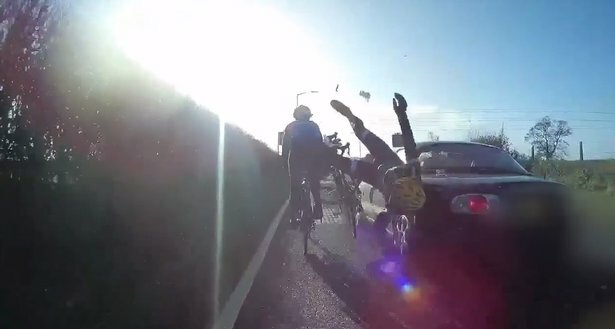 The video shows the riders catapulted off their bikes and left in a heap in the road after the car clipped them before driving into the distance. 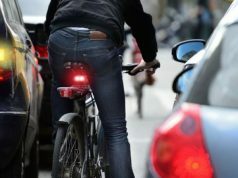 One member of the Yeovil Cycling Club was said to have lost part of an ear and another was left with cracked ribs after the accident. Michael Tarrant, 81, admitted at Taunton Crown Court to dangerous driving. He was disqualified from driving for two years and must take an extended re-test.